- CHIKARA Retribution Rumble Of Revenge And Rumble To Remember (August 27, '04) = Trik Davis fell to BlackJack Marciano. - CHIKARA Tag World Grand Prix '05, Night Two (February 19) = The Perfect Strangers (Davis & Emil Sitoci) lost in the first round of the CHIKARA Tag World Grand Prix Tournament to Team Toryumon X (Milanito Collection AT & Skayde). Arik Cannon & Claudio Castagnoli won the tournament. - CHIKARA Tag World Grand Prix '05, Night Three (February 20) = In a non-tournament match, The Perfect Strangers, Shane Storm, & Team MPW (Darin Corbin & Ryan "Version 2.0" Cruz) defeated Davey Andrews, Shane Hagadorn, Larry Sweeney, & Special K (Cheech & Cloudy). - CHIKARA Speaking In Tongues (April 15, '05) = The Perfect Strangers fell to Mano Metalico & Hallowicked. - CHIKARA Trial By Foam (April 16, '05) = The Perfect Strangers competed in a "Tag-Team Gauntlet" Match, which was won by Knight Eye For The Pirate Guy. - CHIKARA The Grape American Bash (April 17, '05) = The Perfect Strangers & Mickie Knuckles were beaten by Chandler McClure & Sweet 'n' Sour Inc (Larry Sweeney & The Share Cropper). - CHIKARA Young Lions Cup III, Night One (July 22, '05) = Davis lost in the opening round of the Young Lions Cup Tournament to Rorschach. Shane Storm won the tournament. - CHIKARA Young Lions Cup III, Night Two (July 23, '05) = In a non-tournament match, Davis, Mickie Knuckles, & The North Star Express were beaten by F.I.S.T. & The Kings of Wrestling (Arik Cannon & Chris Hero). 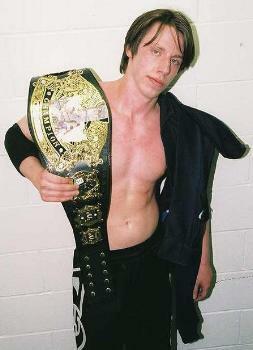 - RoH Hell Freezes Over (January 14, '06) = Davis fell to Jack Evans. Later on, Davis lost a "Six-Man Mayhem" Match to Jack Evans. Jason Blade, Adam Pearce, Sal Rinauro, and Kid Mikaze were the other participants. - RoH Weekend of Champions, Night 2 (April 29, '06) = Davis lost a "Six Man Mayhem" Match to Jimmy Jacobs. Flash Flanagan, Jay fury, Jimmy Yang, and Spud were the other participants. - RoH Chi Town Struggle (June 24, '06) = Davis & Shane Hagadorn were beaten by Irish Airborne. - RoH War of the Wire II (July 28, '06) = Davis fell to Jimmy Jacobs. - RoH Irresistible Forces (October 28, '06) = Davis was taken down by Brent Albright. - CZW Night Of Infamy V (November 11, '06) = Davis lost a "Junior Heavyweight Showdown" Match to Hallowicked. Kenny Stigma and Ryan McBride were the other participants. - CHIKARA From Zero To Hero (And Castagnoli) (November 12, '06) = Davis, Retail Dragon, & Equinox fell to The Order of the Neo Solar Temple (UltraMantis Black, Crossbones, & Hydra). - CHIKARA Brick (November 17, '06) = Davis lost to Kenji Fukimoto. - CHIKARA Talent Borrows, Genius Steals (November 18, '06) = Davis was beaten by Lance Steel. - RoH Chicago Spectacular, Night 2 (December 9, '06) = Davis lost a "Six Man Mayhem" Match to Jake Crist. Dave Crist, Kikutaro, CJ Otis, and Pelle Primeau were the other participants. - RoH Fifth Year Festival - Chicago (February 24, '07) = Davis lost a "Four Corner Survival" Match to Matt Cross. CJ Otis and Shingo were the other participants. - CHIKARA Chapter 11 (November 18, '07) = Davis, Mike Quackenbush, & Helios defeated Shayne Hawke & The Osirian Portal. - RoH Unscripted III (December 1, '07) = Davis lost a "Six Man Mayhem" Match to Dingo. Danny Daniels, Dan Lawrence, Seth Skyfire, and Silas Young were the other participants. - RoH Vendetta II (June 28, '08) = Davis defeated Shane Hollister. - RoH Night of the Butcher II (August 16, '08) = Davis & Mitch Franklin lost a "Tag-Team Scramble" Match to The Vulture Squad. The Briscoes and the Phoenix Twins were the other participants. - CHIKARA The Artistic Pursuit Of Being Yourself (September 20, '08) = Davis, Sami Callihan, & The Order of the Neo-Solar Temple (UltraMantis Black & Crossbones) fell to Trauma & Da Soul Touchaz. - CHIKARA Young Lions Cup VII, Night Two (August 15, '09) = Davis beat Shane Hollister, then lost a "Six-Way Elimination" Match to Player Dos in the Young Lions Cup VII Tournament. Soldier Ant, Ryan Cruz, Grizzly Redwood, and Vokoder were the other participants. Player Dos went on to win the tournament.